One of the most dramatic contributions to human evolutionary studies made by the Leakey family was their discovery from 1959 onwards of the hominin fossils to which Louis Leakey, Phillip Tobias and John Napier in 1964 gave the name Homo habilis. The fi rst specimens were found in the lower part of Bed I of the superlative Olduvai Gorge sequence in Tanzania. The then new dating method, the potassium-argon technique, shocked everyone by revealing an age of 1.75 million years for Olduvai Bed I (Leakey et al., 1961). This high antiquity was one of the factors conducive to the shocked rejection of Homo habilis by almost all our peers. The delicate parietal bones and modest teeth, which seemed to differ from those of South Africa's Australopithecus africanus, were thus of high antiquity. Moreover, they were contemporaneous with an excessively large-toothed austral-opithecine whose remains were found in the same Bed I (Leakey, 1959a, b, c; Tobias, 1959, 1967). 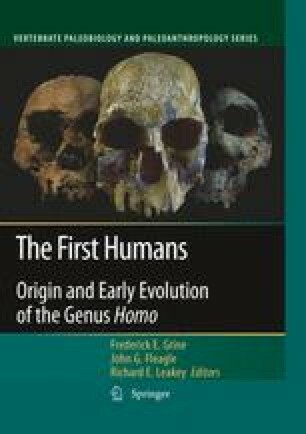 The history of early Homo contemporary with robust australopithecines has been recounted elsewhere (Tobias, 1978). The Olduvai discoveries of 1959–1961 were not the fi rst evidence of an apparent Homo contemporary and sympatric with an aus-tralopithecine to emerge from Africa's soil. A decade earlier, fossils showing every justifi cation to be included in the genus Homo had been found in the Swartkrans cave, in South Africa. Swartkrans had already proved to be an immensely rich source of fossils of Australopithecus (Paranthropus) robustus. In September 1949, a jaw fragment, SK 45, came to light in Member 1 of the Swartkrans Formation. This and other Swartkrans specimens were originally named by Robert Broom and John Robinson Telanthropus capensis. However, in 1957, Simonetta proposed to re-designate it Homo erec-tus, and Robinson (1961) agreed with this. By 1959, when Olduvai began to yield early Homo fossils, the existence of a Homo contemporary and sympatric with large-toothed robust australopithecines had been well-established in the paleo-anthropological record for 10 years. When the Olduvai hom-inins were being studied from 1961 to 1963, the prevailing view was that H. erectus was contemporary with the robust australopithecines.